Tickets £7 online and £9 on the door. Spaces limited so book early to avoid disappointment. 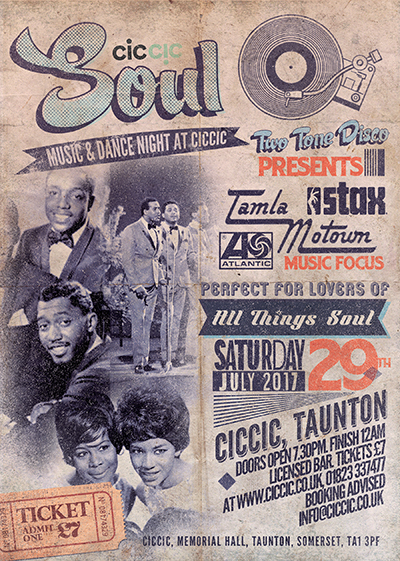 Join us for a night of Soul music and dance courtesy of Two Tone Disco and CICCIC. This event will get your dancing feet moving and there will be a great collection of vinyl’s played throughout the night including songs from a range of label’s including Tamla Motown, Atlantic, Stax, Sand even more soul. If you have not been to CICCIC before then you’ll love our venue. Though small we have 70 tickets available so book early to avoid disappointment. So if you are looking for great night out in one of Taunton’s creative and cultural best kept secrets then come along to our Soul Night.